By Hui Li, Principal Staff Scientist, Data Science, at SAS. The size, quality, and nature of data. The urgency of the task. What you want to do with the data. 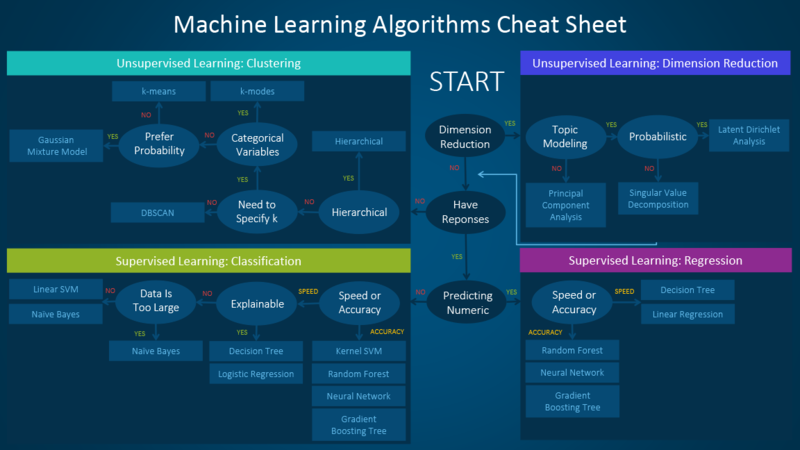 Even an experienced data scientist cannot tell which algorithm will perform the best before trying different algorithms. We are not advocating a one and done approach, but we do hope to provide some guidance on which algorithms to try first depending on some clear factors. Click on the picture below to zoom in. Thanks or attempting this to Dr. Li. Obviously, it's a complex topic. I would be interested in her thoughts on how often the choice of algorithm matters. Which is more productive: improving features (variables), tuning Algorithm X, or trying Algorithm Y. When most dependent variables are numeric, logistic regression and SVM should be the first try for classification. These models are easy to implement, their parameters easy to tune, and the performances are also pretty good. So these models are appropriate for beginners." My manager is a data steward that needs to understand the algorithm to better understand the data. He needs to do this to develop the intuitiveness that the data is right. Unlike things before, we cannot black box algorithms that process data. The moment we do, the plans are wrong, bad decisions are made, and we spend a lot of time chasing and investing in phantoms.